TYPE: Usually considered an annual although it can perennialize. PLANTING: Plant from seed in the late winter or use transplants in the early spring. It will take some frost, but not a lot. BLOOM/FRUIT: White flowers with yellow, cone-shaped center. GROWTH HABITS/CULTURE: Delicate fern-like foliage and small white daisy-like flowers. Easy to grow in any well drained soil. PROBLEMS: Caterpillars, slugs. Spray the worms with the fire ant control mix or Bt product as a last resort. Sprinkle a mix of natural diatomaceous earth, hot pepper and cedar flakes under problem plants for the slugs. HARVEST/STORAGE: Cut the flowers when in full bloom, dry and store in a cool place. The fresh flowers are more potent and make a delicious tea during the growing season. CULINARY USES: Social tea. Children’s tea. MEDICINAL USES: Sleepy time tea. Use the flowers primarily but leaves can also be used. Chamomile has been used to treat gout, indigestion, headache, and colic. Dried flowers in a tea will help relieve indigestion, nausea, nightmares, and insomnia. It can increases appetite, help smokers stop and is good for the kidneys and spleen. Chamomile tea has also been used to treat menstrual problems, asthma, diarrhea, gallstones, toothache and ear infections. Pregnant women should restrict use and avoid totally if a history of miscarriage exist. LANDSCAPE USES: Perennial flowers. Sometimes used as a low mass planting. Attracts beneficial insects. OTHER USES: Shampoos of this herb have been used to emphasize blonde hair. In the garden it is reported to help revive nearby ailing plants. According to Mother Nature’s Herbal, it keeps mint from spreading. INSIGHT: Avoid excessive use of chamomile. 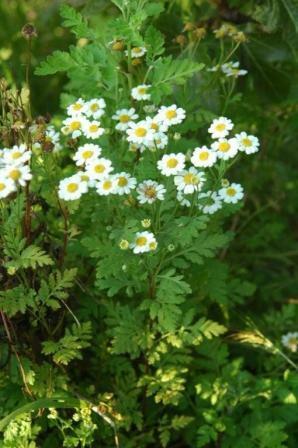 Persons allergic to ragweed, asters, or mums should avoid chamomile.